Why is the wait for a California DMV appointment take so long? Most people dread going to the California DMV (Department of Motor Vehicles) and avoid it as long as humanly possible. Even if you decide to make a California DMV appointment, chances are you may have to wait weeks, if not months, for that appointment. Here is data we have on appointment trends that will help you save time when you book your next DMV appointment. And if you remember one thing from this post, book an appointment, there's no excuse. Consider even express appointments options if you're in a pinch. We recently booked our 1000th California DMV appointment for folks looking to take driving tests, renew licenses, or register vehicles - like you! Our YoGov data team wanted to better understand just how long people had to wait for an appointment at the DMV. 🎈 2018 update: Here are the latest wait times for an DMV appointment online. By now, we know that most California residents have learned that booking a DMV appointment in advance is the way to go. (Do you really want to wait 3 hours and 20 minutes at the DMV?) By booking an appointment you can be reasonably sure that your total time at the DMV will be in minutes, and not hours. However, there’s one problem: the demand for appointments is through the roof, and as such, most appointments are booking several weeks out at any time. Of all regularly scheduled appointments we’ve booked, the average appointment wait is 23 days. And that’s across all the locations in California. In the major cities, such as San Francisco and Los Angeles, the wait can be double that. The farthest away appointment we booked for someone? A whopping 90 days out. Why is it such a problem to wait 3 or more weeks? The answer is simple. As mentioned, people put off going to the DMV for as long as possible. When they finally realize they have to go it’s usually because they need to renew their license or registration, transfer a title, or some other time-sensitive issue. There are often financial penalties associated with late-registration that most people don’t really want to have to pay, too. So, if we book someone an appointment but they need to register their vehicle this week, usually the only alternative is to go wait in line. But there are some alternatives to this. YoGov is here for you! We can help you book an appointment with your local DMV office, or look out for express and earlier appointments 2-3 weeks away. Our team looks out for slots that pop up as people cancel so you don't have to- saving you time looking for an appointment and at the DMV! The numbers are astounding: The average wait for one of these express appointments is 3.6 days. (Compare that to the 23.2 days for “regular” appointments). This may surprise you, since it surprised us too: If you want a shorter wait for an appointment, try requesting on Friday or Sunday. We ran the numbers and found these average appointment waits by day of booking below. The numbers suggest that you can in theory get an appointment 11 days earlier on average if you request on a Sunday as opposed to a Thursday. How is this possible? Requests and cancellations happen throughout the week. When a California DMV appointment is cancelled, that appointment re-enters the system. For example, 1 out of 5 appointments we’ve booked are made on Monday, making this the busiest day for requests. We’d like to think that this is the most popular day in the system for appointments. So if you request on Monday, you’ll be competing in a crowded system. Later in the week, earlier appointments may open up. The good news: We’re using this data when we book appointments. So even if you want to book today, we’ll figure out the best day and time to book your appointment. 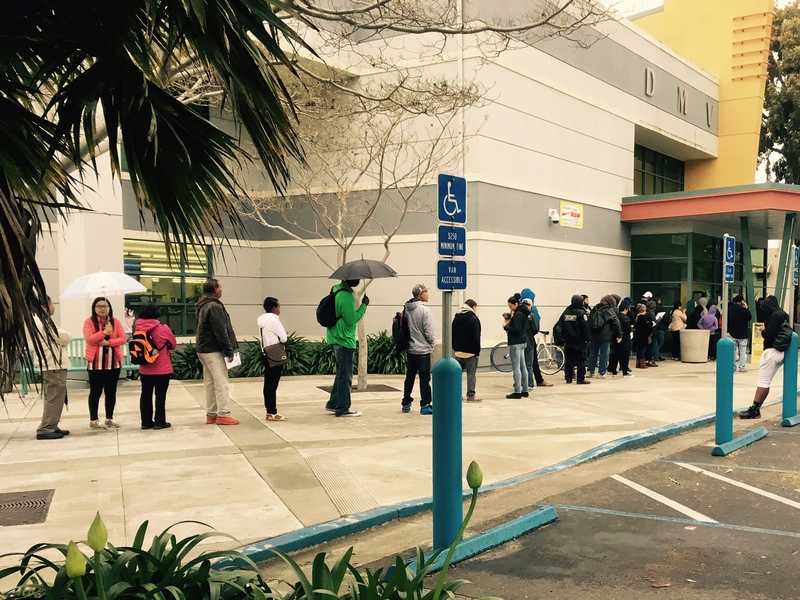 A future of short California DMV waits? As we continue to book dozens of California DMV appointments each day for residents of California, we’re excited to simplify the DMV process for you. Basically, our goal is to improve accessibility and experience with governmental services. By using appointment data and trends, we can get people access to the services they need faster and quicker. Was this article useful? Join the over 250,000 followers and help us help others!